I finally managed to eat the highly mysterious natto. I’ve been curious about natto because weird foods always interest me. It’s like blue cheese. or durian. It’s pungent, stringy, and sticky. I have people who hate it. At the same time, I have friends who love it. So for the curious me, I struggled to wanting to live life not tasting, or tasting it as well. In the end, it was an episode of Iron Chef (the Natto Battle) that convinced me to try this darn thing. Curse you Rokusaburo Michiba for making those yummy treats! I stopped by our usual Japanese grocer and finally bought myself a pack that had a happy family eating Natto. If they looked happy, then I might be happy when I start eating it… maybe. probably. The next day, I ate natto again for breakfast. This time, I did the Iron Chef advise, stir the thing 15 times. I also tried another website’s advise of placing shouyu and mayonnaise after stirring it. The texture was leaps different from my experience the night before. Wow. Now, this is the natto that people loved. The texture was more creamy and it slides down your mouth. It still has that fermented taste, but it’s strangely softer. Even when you eat the natto alone, it tastes great. Like seasoned cheese with that aged taste. It was elegant to the tongue, and if I didn’t have to go to work the next day, I’d eat it again. So, natto is not so bad at all. You just have to know how to prepare it so that you can maximize the taste. I’ll try more natto combinations later. I love the shouyu mayonnaise combo best. Maybe I’ll spring onions this weekend. 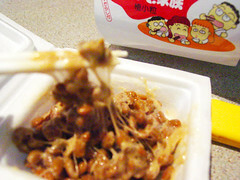 <3 Oh luffles to this lovely natto! I see!! Im glad you enjoyed your natto after all!! & Im surpriced by your courage o food! !